Our dedicated and generous supporters provide more than 4,000 homeless animals each year with medication, food, and expert care from our loving staff. Thousands of additional animals are helped annually through our programs and services, including the Community Veterinary Clinic, the Cleo Fund, Canine Training and Humane Education. Donating to the animals is easy and can be done in a variety of ways. General donations are used for daily animal care, shelter operations and program support. Donate over the phone using your credit or debit card by calling (207) 985-3244 ext. 200. Donate in person by stopping by our facility during business hours. Gifts may be made in memory or in honor of family, friends, colleagues and pets. Pay tribute to your loved ones. Leave a lasting gift on the beautiful campus of the Animal Welfare Society with a granite paver in the Adoption Center’s entryway. Make a lasting gift today. In-kind donations of food and supplies keep us running. Wish list items can be dropped off at AWS or purchased online to be delivered right to our doors. See our wish list for the items we need most of all for our animals. 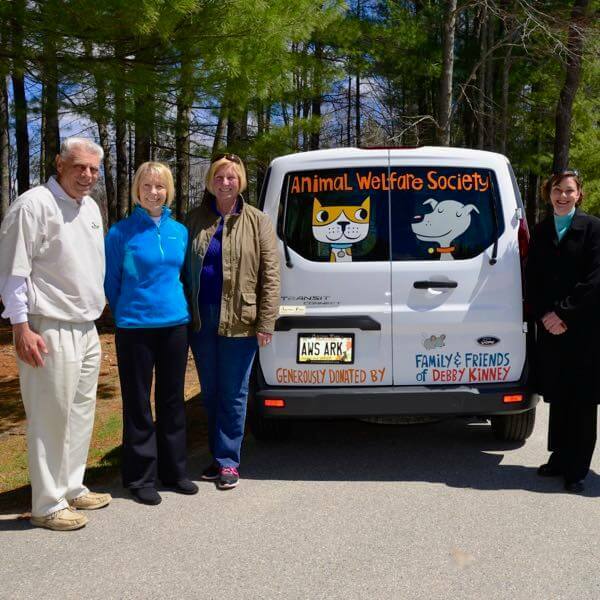 Donating a car is a great way to help animals. Working with Vehicles for Charity makes the process simple and straightforward. Proceeds from the sale of the car support AWS animal care and programs. Get more miles from your used wheels by donating now. There are many ways businesses can impact the health and wellbeing of pets in need, support AWS community programs and foster philanthropy (and fun!) amongst employees. Engage your employees in your company’s philanthropy. The many charitable and compassionate animal-loving children inspire us daily with their compassion and generosity. Be a youth hero today. Every gift – no matter how big or small – keeps AWS going year round. Make an impact year round with a monthly gift. Planned giving encompassing a variety of giving options, including appreciated securities, charitable IRA rollover or trust income contributions, and/or estate gifts through bequests or beneficiary designations. Start planning your future giving now. We are pleased to have loyal supporters who conduct fundraisers on our behalf, whether it be to collect financial gifts or supplies. If you’re ready to get started, be a DIY fundraiser for the animals.